Home / concert / gin lee / music / news / resorts world genting / world tour / Tickets to Gin Lee’s first concert in Malaysia go on sale early January! Tickets to Gin Lee’s first concert in Malaysia go on sale early January! 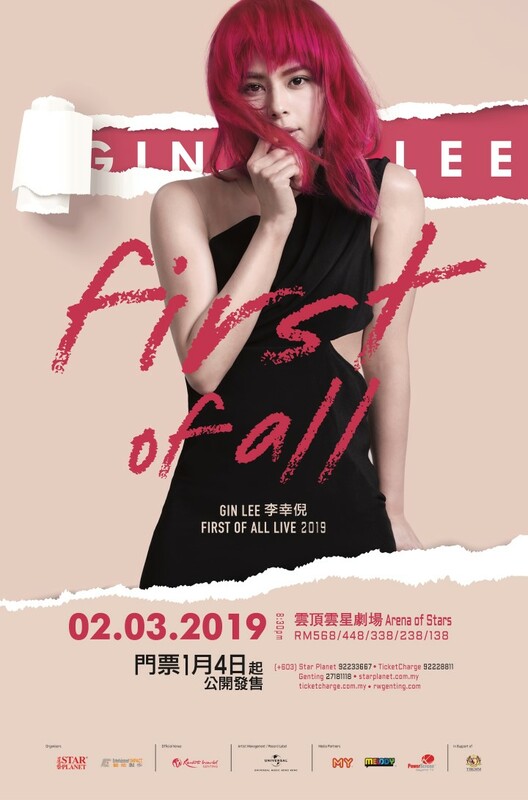 Gin Lee fans, get your money ready because you’re going to be spending the early days of 2019 grabbing the tickets to the singer’s first concert in Malaysia! Having successfully held her first solo concert at the Hong Kong Coliseum, the Malaysian singer is now returning to her home country to hold her “First of All” concert in March. Moving on to the tickets, which are priced as the following (excluding RM4 ticket fee): RM568, RM448, RM338, RM238 and RM138. The tickets will go on sale from 4 January 2019 (Friday), 11am. 15% Early Bird discount will be given to the first 1,000 tickets sold. “First of All” World Tour in Malaysia! Call Star Planet 03-92233667 / TicketCharge 03-9222 8811 / Genting 03-2718 1118 or visit www.ticketcharge.com.my / www.rwgenting.com / www.starplanet.com.my to purchase the tickets. To the uninitiated, Gin Lee has been in music industry for almost a decade and found fame after joining “The Voice of China Season 4”, where she was mentored by Jay Chou. In 2016, her album “beGin” topped the Hong Kong Record Merchants Association (HKRMA) sales chart for four weeks. Not only that, the Hong Kong Recording Industry Alliance (HKRIA) also gave it a platinum certification.